[S.P. News] Who Will Answer The Call? « [Site] Say Hello To Your New Webmaster! Follow the accounts of Tamerlin. 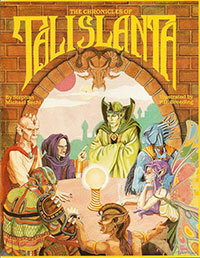 Traveler, self-styled wizard, and obscure author of ancient times as he explores the magical land of Talislanta. Discover the myriad wonders and oddities of a forgotten age including; the Dream Merchants of Phantas who sail the skies in fabulous windships bearing the most costly and exotic wares. The Maze-City of Altan, carved over centuries of time from a single mound of violet stone. The Aberrant Forest, the Sindarans, the Crimson Citadel, the Xambrian Wizard Hunters, and the many strange peoples, places, and creatures native to the world of Talislanta. This entry was posted in Scanning Project News. Bookmark the permalink. Both comments and trackbacks are currently closed.